Hammond (April 11, 2011) – More than a dozen South Shore attractions will gather for the Inaugural Explore the South Shore event hosted at the Indiana Welcome Center in Hammond on May 14th from 11am to 4pm. The event will kick-off the travel season and is held in conjunction of National Tourism Week. The first 500 families attending Explore the South Shore will receive a “passport of savings” for coupons and discounts throughout the region. Giveaways and chances to win other items will also be available. Kid’s activities like a bounce house, games and train rides, classic cars, family photo opportunities and food will be available onsite. Mascots, a livestock area and live entertainment will entertain and create awareness of upcoming events in northwest Indiana. Information booths will be set up for each participating organization. For more information call 219.989.7979 or visit www.explorethesouthshore.com. 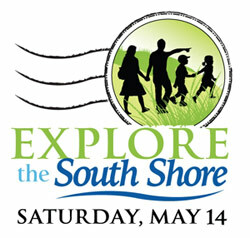 Entrance to Explore the South Shore is free and guests of all ages are welcome to join in the fun. The Indiana Welcome Center is located at 7770 Corinne Drive (I-80/94 and Kennedy Avenue) in Hammond.